For x86 The most common type of CPU for Windows and Linux VMs in Skytap Cloud. VMs, Skytap uses VMware virtualization software to create VM images. Different versions of this software produce images with different “hardware versions.” At regular intervals, Skytap introduces support for new hardware versions, which typically offer new capabilities, including additional CPU, RAM, guest OS, and network adapter options. VM hardware versions are unique to x86 VMs. Power A particular type of CPU that supports IBM i, AIX, and Linux in Skytap Cloud. VMs don’t require VM hardware upgrades. When a VM uses an older virtual hardware version, an upgrade message displays on the Hardware tab of the VM Settings page. Save the environment as a template before upgrading so that you can roll back if needed. For more information, see Saving an environment as a template. 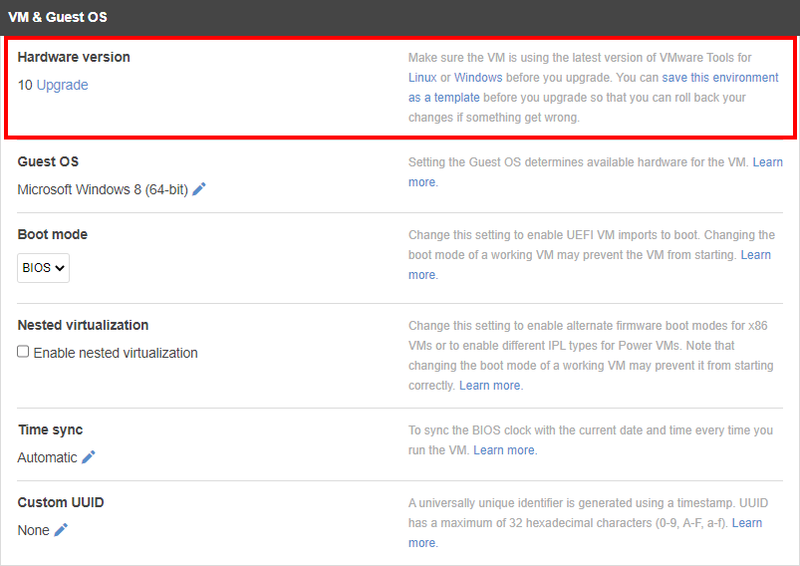 In the guest OS of the VM, upgrade VMware Tools to the latest version (10.0.6 build 3560309). From the Hardware tab of the VM Settings page, click Upgrade. The upgrade process completes automatically. For more information about additional steps that may be needed after the upgrade, see Upgrading a virtual machine to the latest hardware version (multiple versions) (1010675). For more information about hardware versions in Skytap, see Checking VM hardware version.